Reward yourself with a traditional Bakewell Pudding after walking or cycling the 9-mile Monsal Trail (also known as the Cake Trail). It follows the former railway line offering spectacular views of the Derbyshire countryside and the magnificent Monsal viaduct as you taste and go. Derbyshire’s Cake Trail comes with its own sweet sugar rush. It follows the popular Monsal cycling and walking trail and highlights traditional tearooms, cafés and restaurants specialising in locally produced bread, cakes and patisserie. It ends in the town of Bakewell which is world famous for its Bakewell Pudding. A fabulous foodie and fun day out for all the family. The Monsal trail runs through the Peak District National Park and rewards you with plenty of excitement as you cycle through a series of dimly lit former railway tunnels. It starts at Blackwell Mill at Wye Dale and takes you along the former railway line to Bakewell Station. You’ll see limestone cliffs, the River Wye meandering below, Litton and Cressbrook Mills where they used to produce cotton for the lace-making industry, and ‘la pièce de résistance’, the Monsal viaduct, one of Britain’s most impressive viaducts. Whether you’re pedaling or walking along the Cake Trail, take a short detour off the trail for a sweet treat. Just remember to leave space for some Bakewell Pudding at the end. The Litton Village Shop is a community-run village shop with its own café. 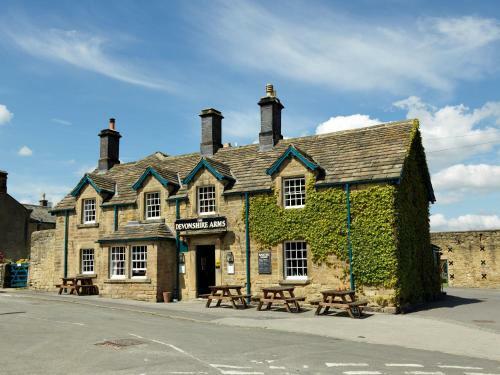 The Monsal Head Hotel makes a good half way stopping point for coffee or lunch and has wonderful views across Monsal Dale. They like dogs here too. Although it’s towards the end of the trail, we love the café at Hassop Station. With its beautiful building and book shop, it’s a perfect place for a late lunch or Afternoon Tea. There are lots of places in Bakewell where you can try the famous pudding. The Old Original Bakewell Pudding Shop is a crowd-puller because it claims to have the original recipe. If you still have a hearty appetite after cycling the Monsal trail and enjoy fine dining, book in for dinner at the stylish Peacock at Rowsley. It will be a fitting end to your delicious day out in the Peak District. A Bakewell Pudding is made with puff pastry and is best served warm. It’s not to be confused with a Bakewell Tart which is made with shortcrust pastry. Doggie heaven. This is a fantastic day out for me. Make sure you keep me on a lead especially when we go through the tunnels as it can be difficult for cyclists to see me. Discover more Cycle Routes For Foodies.